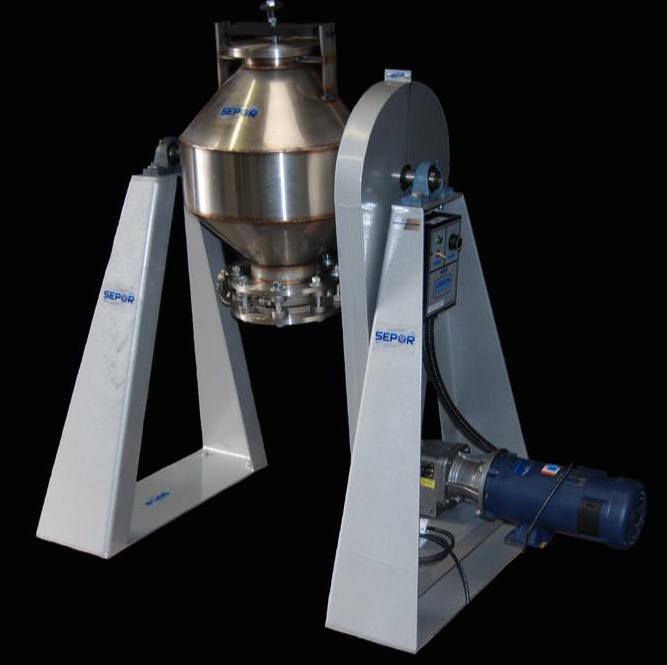 The Sepor cone blender’s are manufactured with all contact parts of stainless steel. Standard configuration of the cone blenders includes a variable speed control, belt drive, shaft mounted speed reducer or gear motor, mild carbon steel stands which allow for 18 inches of floor clearance, butterfly type discharge valve, gasketed load opening plate secured by a crossbar with hand wheel, heavy duty pillow block shaft bearings and normal electrical configurations of 110V V/1Ph/50-60 Hz or 220 V/1 Ph/50-60 Hz. The cone vessel is comprised of two opposed cones, welded to a cylindrical center band. The center band has two oversize machined trunnions, 180 degrees apart, welded to it to provide an axis about which the vessel rotates. The angle of the cone is 45 degrees. The diameter of the 24 Inch Diameter Cone Blender center band is 24″, which is also the cone blender size. (An 18 inch cone blender has a 18 inch diameter center band). 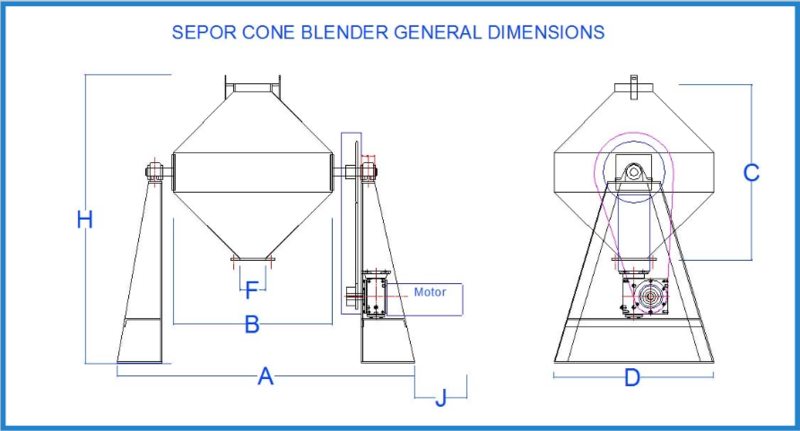 Blending, in a cone blender, occurs, by slowly rotating the blender, where the angle of the bottom cone becomes tilted beyond the angle of repose of the material in the blender. Multiple surface layers then flow towards the empty cone, followed by the remainder of the material, in mass, to the empty cone end. The cone shape pushes a portion of the material towards the center, and upwards, where blending takes place. The shape of the dual cone, and the facts that no two particles travel in parallel directions, but rather in random directions, and all of the particles tend to have many differing velocities as they travel from end to end, lead to rapid blending inside of the vessel. Ten minutes will generally give a homogeneous mixture, which is a perfect blend. No other blender can do this. The Sepor Rotary Cone Blenders are excellent for blending of dry and semi-dry products. A wide variation of material types may be effectively blended, obtaining reproducible results. Over blending cannot occur. The Cone Blender will effectively blend fibrous materials and powder or granular materials. The Sepor Cone Blenders are easy to operate, with ample feed and discharge openings, easily cleaned between batches and are economical. Power costs are very low and no operator attention is required while blending is in process.